Tre Stelle® cheese lovers have a new way to keep informed about their favourite indulgence - Melt Magazine Online. 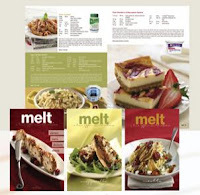 Melt Magazine is your premier companion for Tre Stelle® Cheeses. And it's free! Filled with mouth-watering photographs and more than a dozen new, kitchen-tested recipes in each issue, Melt Magazine explores the versatility of cooking with cheese. You can receive this publication – optimized for Smartphones and tablets -- in English or French, twice a year. All you need to do is sign up for Melt online! Every edition of melt also features exclusive, money-saving coupons and a chance for you to win prizes!